1 Remove the engine/transmission (see page 5-3). 2. 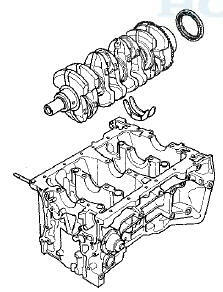 Remove the transmission: - Manual transmission (see page 13-7) m Automatic transmission (see page 14-194) 3. M/T model: Remove the flywheel (see step 17 on page 12-18). 4. A/T model: Remove the drive plate (see page 14-204). 5. Remove the oil pan (see page 7-11). 6. Remove the oil pump (see page 8-17). 7. Remove the cylinder head: - All models except PZEV (see page 6-27) - PZEV model (see page 6-76) 8. Remove the baffle plate. 9. Remove the 8 mm bolts. 10. Remove the bearing cap bolts. To prevent warpage, loosen the bolts in sequence 1/3 turn at a time; repeat the sequence until all bolts are loosened. 11. Remove the lower block and the bearings. Keep all the bearings in order. 12. Remove the rod caps/bearings. Keep all the caps/bearings in order. 13. Lift the crankshaft out of the engine. Be careful not to damage the journals and the CKP pulse plate. 14. Remove the CKP pulse plate from the crankshaft (see page 7-30). 15. Remove the upper bearing halves from the connecting rods, and set them aside with their respective caps. 16. If you can feel a ridge of metal or hard carbon around the top of each cylinder, remove it with a ridge reamer (A). Follow the reamer manufacturer's instructions. 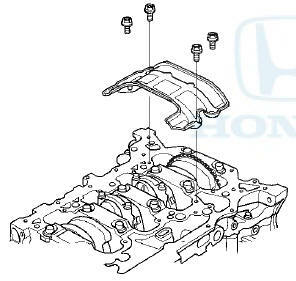 If the ridge is not removed, it may damage the pistons as they are pushed out. 17. Use the wooden handle of a hammer (A) to drive out the piston/connecting rod assembly (B). 18. Reinstall the lower block and the bearings on the engine block in the proper order. 19. Reinstall the connecting rod bearings and the caps after removing each piston/connecting rod assembly. 20. Mark each piston/connecting rod assembly with its cylinder number to make sure they are reinstalled in the original order.